Future focused agricultural networking! Lots of interesting things happening in Triangle Agriculture right now! Join us to mix, mingle and get the scoop. Plus…it’s Review Time! Congratulations! We’ve been getting together to talk all things Ag for well over a year now. 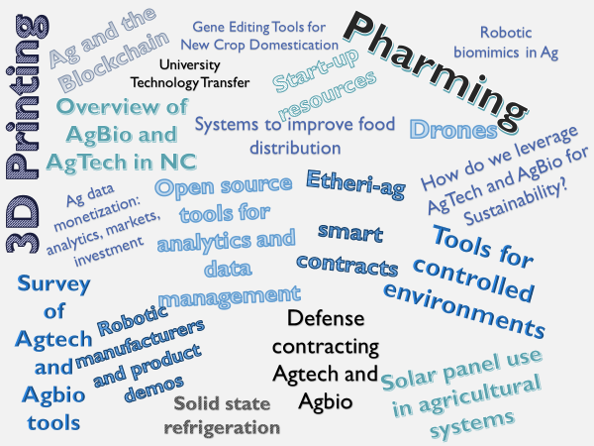 Which AgBio+AgTech meetings were your favorites? What would you like to see more of in the future? Join us to hear a re-cap of our featured events, analysis of the group’s growth and to discuss fresh ideas for the future of AgBio+AgTech. Or, find a visual summary of 2017 in our about pages.